Some of you might be wondering what is NBTD... it simply stands for Nothing Better To Do. Some of you maybe gaming, watching tv, day dreaming, sleeping, etc etc. When i have nothing better to do. I'll just grab myself a piece of paper and draw. But recently, i found out that Microsoft has improved their MS Paint. 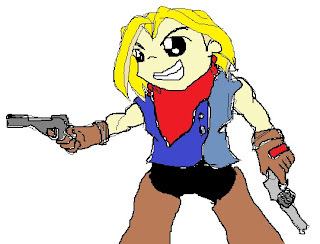 And so, i drew using MS Paint and my trusty mouse. The drawing is very rough i say... Hope to get myself a tablet for drawing but... maybe later. Hahahahaaa. It's not like it's a necessity. Hope you enjoy my short post and feel free to drop a comment. hahha...nice piece of art...keep it up and am sure it would be much better drawing using a tablet..